With a fresh crew on board, which included our new skipper Mick O' Meara and some old IWDG heads like Conal O' Flanagan and Joanne O' Brien, we finally had a weather window to round the imposing North West peninsula of Hornstrandir. This was a hard overnight passage during which we had to endure a long rolling swell, which made for some unpleasant sea conditions, which took a toll on some, myself included. But for the panoramas alone as we rounded Hornbjarg, it was simply stunning. The mid-night watch revealed our first icebergs on the horizon, but there were only a few and too far away to cause much concern. Only days earlier there was a risk of the Icelandic Coastguard having to close this route as the Greenland Icepack was being blown to within 3km of the shore by strong northeasterlies, with potential > 50% coverage. This would have been a huge problem for the expedition, as although the Celtic Mist is a fine open ocean vessel....she's no icebreaker! Another remarkable thing about this passage was that in almost 21 hours of sailing in some of the most productive waters on the planet and in reasonable viewing conditions and 24 hours daylight, we didn't have a single cetacean sighting. It would be inconceivable that Celtic Mist would survey for a whole day in Irish waters without a single sighting entry being input into the Logger software that we were running throughout. This was our first strong evidence that if you want to find marine mammals in Icelandic waters, that open waters may not be the place to be looking. The vast majority of humpback sightings to date during this expedition were from the major Fjord systems and the inlets within them. In the early hours of the morning we were crossing the huge Húnaflói bay and as we approached Skagafjördur at around 07:00 am we starting seeing our first distant blows, which resulted in our 1st north coast fluke shots. Interestingly during this early session with these whales, we were reasonably confident that in among about 2-3 humpbacks there was one animal that consistently showed a very tall columnar blow and tail fluked. This was likely to be our 1st blue whale Balaenoptera musculus. But after the long overnighter, neither the skipper or the crew had the energy for commencing a long game of cat and mouse with a blue whale that could cruise much faster than the Celtic Mist. So content with our fluke shots we continued into the stunning Fjord town of Siglufjorður, which is where the Icelandic thriller series "Trapped" was shot. We spent the day sorting out matters of personal hygiene, and catching up on sleep and enjoying the ambience of this really attractive "Alpine" Village. That evening we were re-joined by Karen Wilkinson, Inis marketing manager, who loved her 1st week's leg so much that after returning to Dublin, she booked another flight to Iceland in the hope of rejoining us for a few shorter trips on the northern leg. Left Siglufjorður at around 10:00 am on what was a simple enough run east into Eyjafjörður. We had originally planned on travelling to the end of this Fjord and to spend some time in Akureyri, the country's second capital in the North, population 16,000, but we'd lost too much time in the West Fjords waiting for our weather window. So we motor sailed through the day, making landfall at Dalvik around midnight. Don't forget, that midnight at these latitudes on mid-summers is a little meaningless in terms of daylight as it's almost as bright at 12 midnight than it is at 12 midday! Once again we encountered good numbers of humpback whales during the day. So not surprising that we are now beginning to get a sense as we call into northern coastal towns as to the importance of whales and whale watching to the local economy. 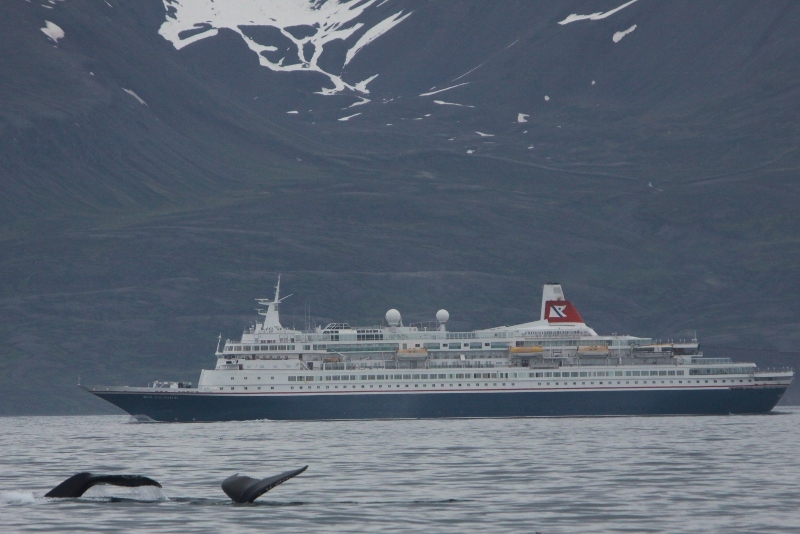 Each town seems to have several commercial operators providing a range of boat-based wildlife and whale watching products, and from what we've seen the boats really don't have to travel too far from their home port to find animals a plenty within their sheltered local Fjord. The potential for wonderful encounters against such jaw-dropping scenery is endless. We left Dalvik bound for Grimsey Island in the Arctic Circle, with a very full boat as also on board were two US research students who were carrying out a field study out of Husvik on the impacts of whale watching boats on the behaviour of whales. 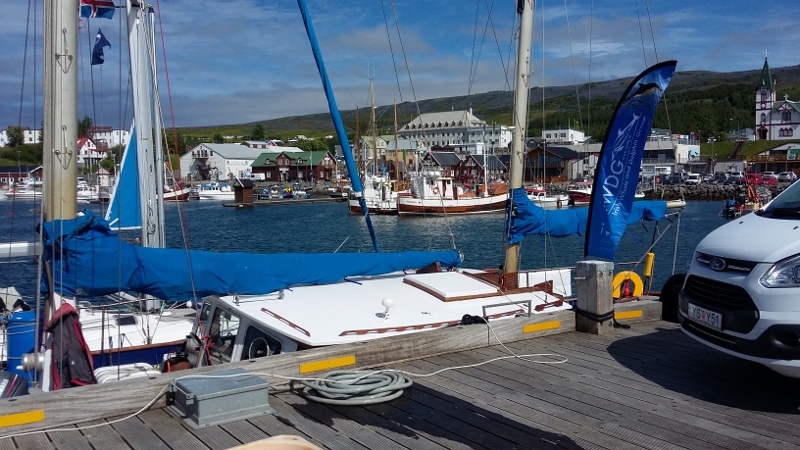 Sailing out of Eyjafjörður in brilliant calm, sunny conditions, spirits were high when we encountered our 1st humpbacks of the day. But this was all shortlived, and they were the day's last humpbacks as the wind picked up very considerably and not long outside the Fjord it was blowing a strong Force 7. You know things are getting serious when the skipper relieves us "non-sailors" from helm duties and furniture starts flying around the cabin. The 40 km, 5 hour passage north to Grimsey was exhilarating, to say the least, and those of us who'd stomachs had struggled to round the Horn, only a few days earlier, now seemed to have the measure of the Celtic Mist and the big seas, as she travelled under full sail into Arctic waters. In the morning sunshine, there was banter about Tony filming an Arctic plunge by the crew, but by the time we got to Grimsey, there was a lot less enthusiasm, as most of us got a good soaking anyway during the passage. The small island of Grimsey, population 22 souls, is cut in two by the Arctic Circle line and is home to some of the biggest concentrations of seabirds (Arctic terns, puffins and eider duck) we'd seen yet. 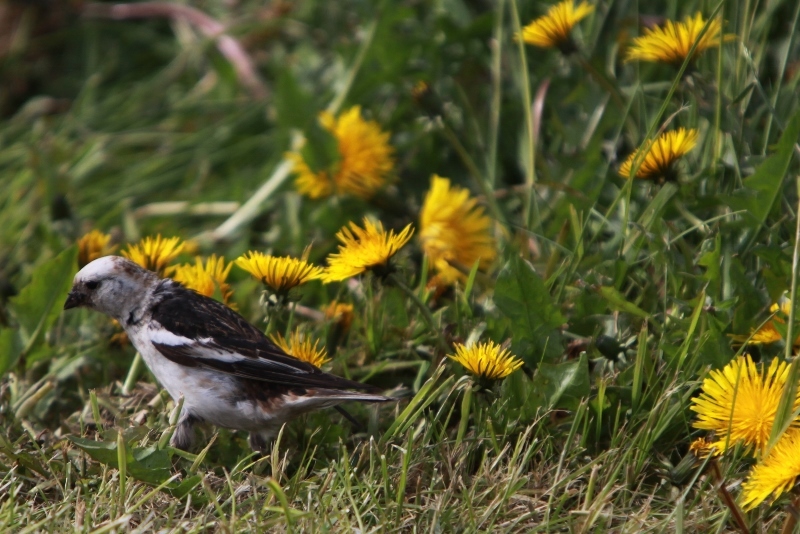 The sea cliffs, once you leave the harbour, are alive with the sound of nesting seabirds. A truly remarkable outpost, and the fact that anyone at all lives here is a testament to the pioneering spirit of these fiercely independent people. After the traditional group photo of the Celtic Mist and crew in the Arctic Circle and some last minute shots of the Island's aggressive Arctic terns, puffins, snow buntings and red-necked phalaropes we left Grimsey's safe harbour and into open water as we headed south-west towards Skalfandi Bay and Husavik. Once again, open water proved rather non-productive, without any sightings despite the calm sea conditions, but that soon changed when we drew closer to land, entering the area north of Skalfandi Bay. 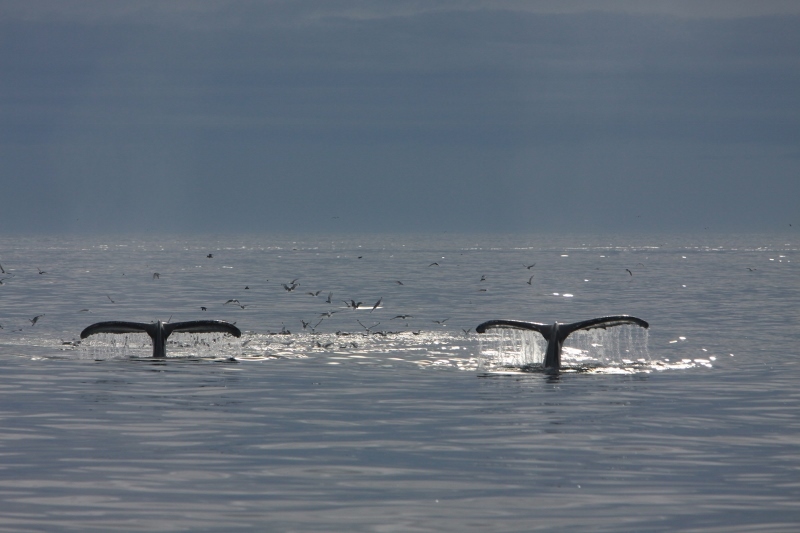 It was clear that there were many humpbacks here and it became clear why Husavik promotes itself as the unquestionable Icelandic Whale Watch capital. During the course of a few hours we'd probably secured fluke images on a dozen or so humpbacks, but then it got really interesting when a pair of animals we'd been tracking for a few minutes appeared just too big, with too tall and narrow a blow, and a mottled bluish colouration. 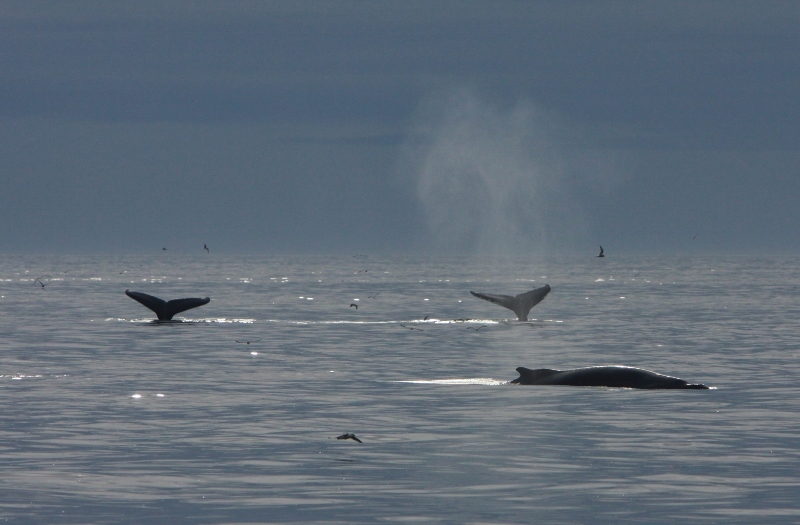 We had our 1st confirmed expedition blue whales; a mother and calf pair (Image right). 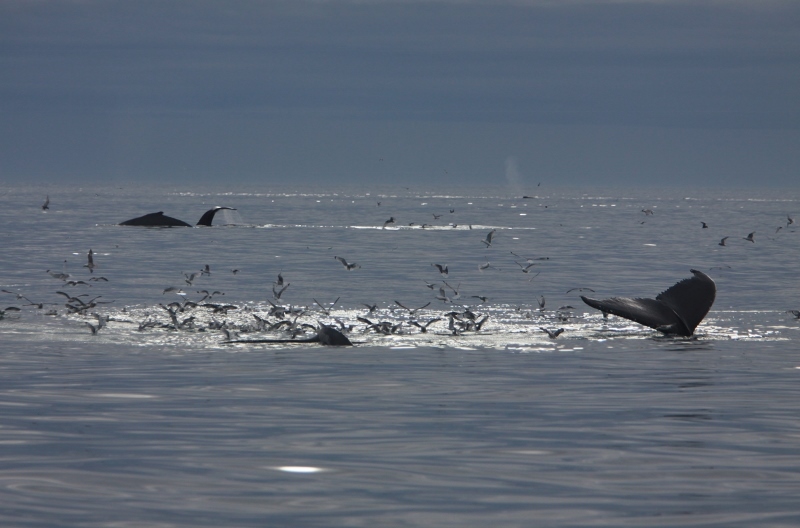 This was my 1st time seeing blue whales in the Atlantic, and a memory that will remain engrained for many years to come. It was interesting that it took a while for us to realise that these were, in fact, blue whales before the first shout went out, and a lesson for us all, of the importance of remaining vigilant and to expect the unexpected. 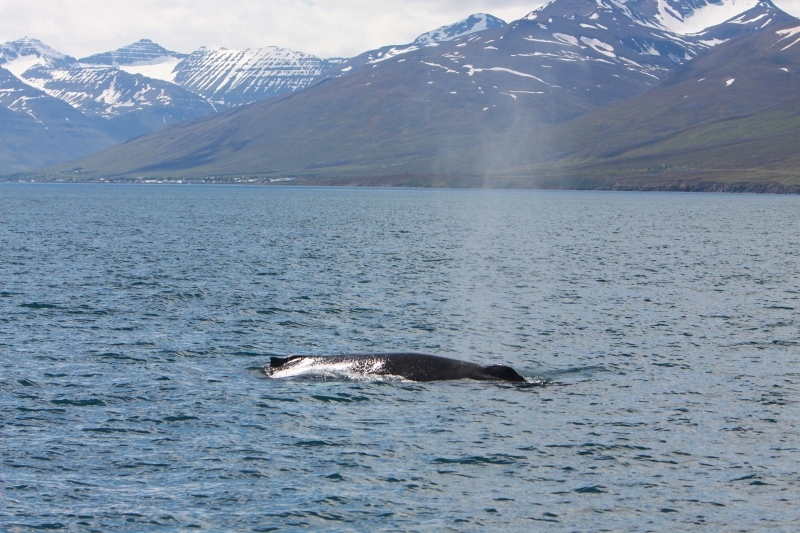 As it happens our friend and colleague Christian Schmidt who is a senior guide with North Sailing out of Husavik told us later in the day that there was also in the area that same day a hybrid blue & fin whale, which would have been fascinating to see. At a glance, through the humpback fluke Id images obtained during the afternoon between Skalfandi Bay and Husavik it is very likely that on that one session alone, we collectively got 35+ humpback Fluke IDs. A remarkable achievement and not really difficult to see how some of these humpback hotspots have catalogues that run into the thousands. 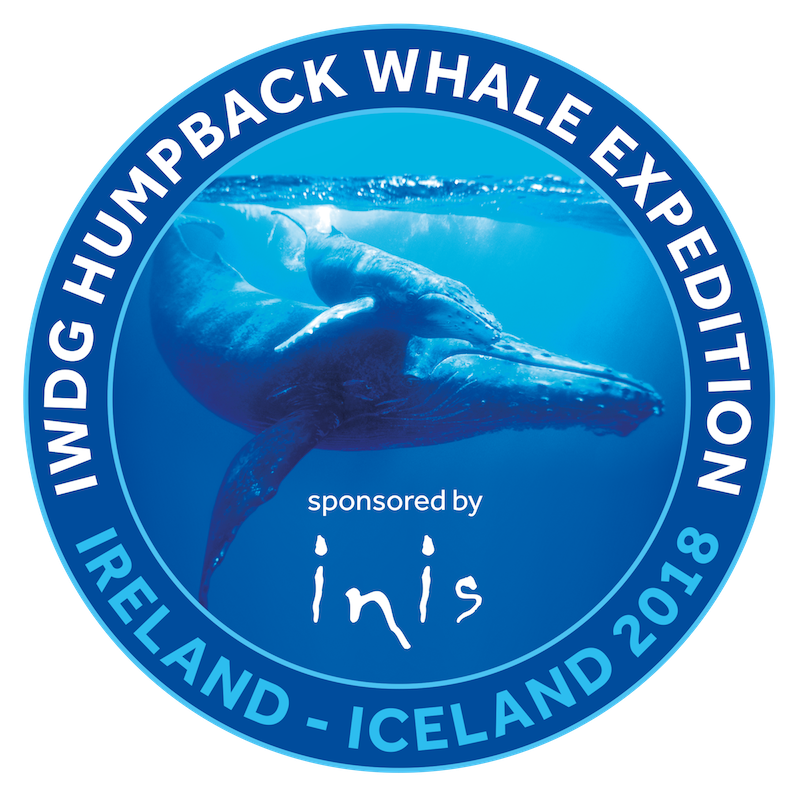 When we get home and have time to trawl through them all, it will indeed be fascinating to see which individuals we captured when we share the images with Icelandic researchers, and of course, we'll be paying particular attention to any likely matches with our own Irish humpbacks. 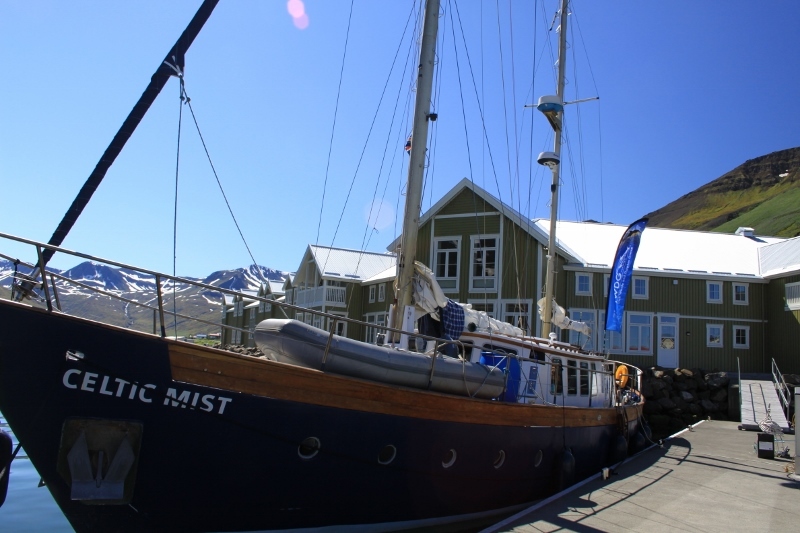 A day for welcoming visitors on board Celtic Mist and flying the flag for IWDG in this busy maritime centre, a little recuperation, and a visit to the famous Husavik Whale Museum, before the long 8-hour drive back to Reykavik's International airport at Keflavik for the next crew change. A huge thanks to an already tired Simon Berrow and Tony Wheelan for sharing the driving duties across this beautiful country. This is an amazing country and one most of us felt, we've probably not seen the last of.